By far one of the best film documentaries I have seen. Filmed by former National Geographic photographer Louie Psihoyos The Cove aims to bring to light the annual slaughter of bottle nosed dolphins in Taiji, Japan. Louie and his team, including former dolphin trainer and television star Ric O’Barry, use the latest high tech cameras and audio equipment to record the massacre and show the world what is really happening in this tiny Japanese fishing village. 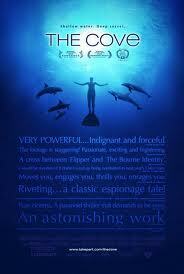 Superbly shot and shocking beyond belief this award winning documentary is a must see. Using interviews and undercover surveillance the team are able to present more than enough evidence to help bring a stop to dolphin and whale hunting.